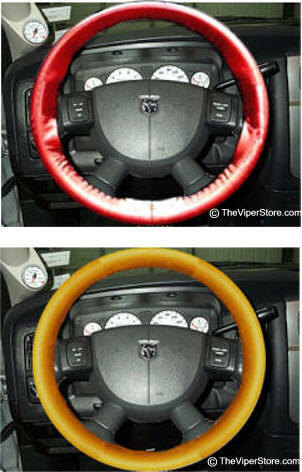 WS-RT-SW-2COL Dodge RAM SRT-10 (2004-06) Genuine Leather Steering Wheel Skin. Fits stock steering wheel. 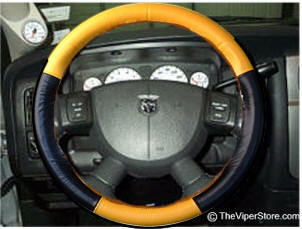 Wheel skins are the finest, most luxurious steering wheel covers available anywhere. Handcrafted in the USA in many different colors. 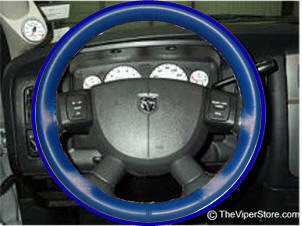 Wheel skins are the perfect upgrade accent for your Viper trucks body color. Comes sized to fit. You stitch together with materials provided. Takes about 1 hour for install. Colors: Tan, Yellow, Cobalt Blue, Red, Burgundy, Green, Black, Black, Charcoal, Grey, White. Measure around your steering wheel's widest spot in inches. 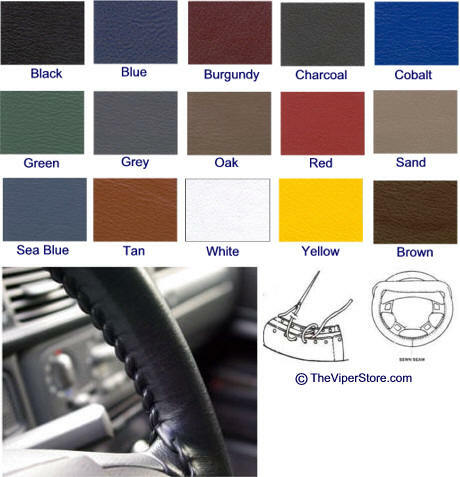 Measure your steering wheel straight across through the center.